I would like to ask, what is the blue circle in the middle of the board? I really want to build this boost. Hi Quang, it's a trimmer, 5k would be a good size to use. It replaces the 3.9k resistor that's usually used in a Rangemaster so you could always just stick a resistor in instead if you're not bothered about tweakability, or you could always use a conventional pot instead and mount it externally with wires to the tags if you prefer. can you tell me where the pins for the trimmer are attached to the tags? are pins 2 & 3 on one tag or split between the two uppermost tags in the diagram? Pins 2 and 3 are soldered to the same tag. In fact you really don't need to solder pin 3 at all, it's being used as a variable resistor so you can just use two pins, 1 and 2. Hey Mark, you wouldn't happen to have a vero layout for the Red Rooster would you? 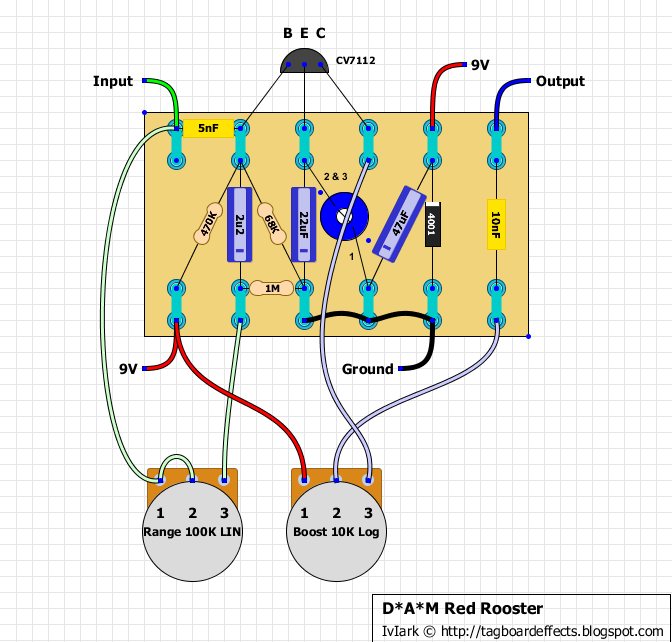 Someone could tell me what are the values (tolerance and voltage) required for the components to build this DAM red rooster clone ? 1% metal film resistors are cheap enough and fine for this, and caps should be rated at least 16V, and as close tolerances as you can get. Typically polyester caps will be 5 - 10% and electrolytics will be 20%. I use both all the time and they'd be fine. I've just finished my Red Rooster clone and I'm very happy with it. I had to put in it an ASY28 germanium transistor (TRASY28) which is an equivalent of the CV7112 because I don't find this one. I bought on ebay a pair of NOS Mullard OC140 but they didn't work in the pedal (noises and volume loss)so I put back in it the ASY28. Do you have an idea why the OC140's don't work ? And last question, I've seen on the D*A*M website that they generally use OC71's and OC45's germanium transistors. I don't understand because it need an NPN germanium transistor just like CV7112, ASY28 or OC140 ? I have an old Mullard OC45, so do you think I can put it in my clone ? (I don't want to damage my pedal testing this OC45). Thanks a lot if you could help me, it would be great ! You'd need to test the OC140's but in all honesty they're probably trash. A lot of the old Newmarket germaniums you can find on eBay are junk, that's why now I pretty much stick to more modern Russian or Japanese transistors which are cheaper, more consistent and more readily available. The only schemes of the Red Rooster that I've ever seen use NPN transistors, so I don't know whether that is a mistake because the old Rangemasters used to use OC45s or OC71s. Ok,thanks. So, I'd rather let the ASY28 in my pedal if I follow your advice. The ebay seller will send me another OC140's ... Do you think my clone would sound better with that OC140 (if it's no trash this time) than with the ASY28 or not ? No pedal will sound better simply because you've used one type of transistor over another. If the seller can guarantee it is around 100 hfe and low leakage then it might sound great, if not then a Russian or Japanese transistor which does have those attributes will sound better. You can get 20 x Russian MP38A's for around £8.50 delivered off eBay, I bought a batch of 50 which ranged from 54 to 90 hfe and all had very low leakage. They will sound much better than any old leaky transistor with unknown gain. Hi, could you please check why the post are different from Red Rooster vero layout? Done from two different schematics 18 months apart. Use the values shown in the vero layout. Thanks! I was thinking the same. I built the vero version with an OC139, sound awesome, and I am deeply greatfull to you. Thank you and thank you!